First appearances and central judicial processing (CJP) hearings conducted in Superior Court are streamed LIVE from various locations around the state for the public to view on a computer, tablet or smartphone, generally during non-business hours. Check the locations below for when and how to watch the proceedings in each county. 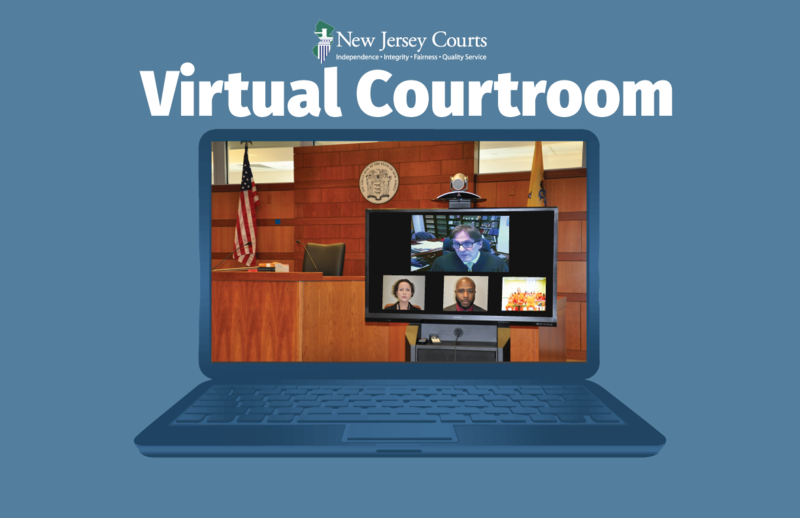 Virtual Courtroom participants, including judges and attorneys, click here for more information. Virtual Courtroom - Click here to watch. Weekend\Holiday First Appearance Hearing Start Time: 1 p.m.
Weekend\Holiday First Appearance Hearing Start Time: 2 p.m. Visitors can park in the Visitors Lot off of South River Street. The court proceedings can be viewed via the internet virtual courtroom which will be broadcast in the Jail’s Reception Area for the public viewing. Weekend\Holiday First Appearance Hearing Start Time: 11:30 a.m.
Weekend\Holiday First Appearance Hearing Start Time: 1:30 p.m. The waiting area or lobby will be opened to the public. The public will be able to view the virtual hearing from the waiting room on the 4th Floor of 6 Executive Campus, 1112 Union Ave, Cherry Hill, NJ 08002 or from home. Weekend\Holiday First Appearance Hearing Start Time: 1:15 p.m.
Weekend\Holiday First Appearance Hearing Start Time: 11 a.m. Parking information: There is a paid parking lot on the corner of Central and Pavonia Aves. Weekend\Holiday First Appearance First Appearance start time 1:30 p.m.
Weekend\Holiday First Appearance Hearing Start Time: 2:30 p.m.
Weekend\Holiday First Appearance Hearing Start Time: 2:00 p.m.
Telephone number for Passaic County Pretrial Services is 973-247-8383. Entrance to the Union County Correctional Facility is through the main entrance. Once you clear security and the magnetometer, go up the stairs to the 2nd floor where the courtroom is located. No contraband is allowed. If you bring it, it will be confiscated. No Cell phone use at all in the courtroom. This includes the taking of photos and/or any type of recording. Weekend\Holiday First Appearance Hearing Start Time: 12:30 p.m.